High Pressure Water Jetting in Seattle: Do You Need It? Whether from the unavoidable build up of waste material, or the accumulation of unflushables like feminine products, grease, and paper towels that always find their way down drains, the pipes that carry waste water away from homes and other buildings inevitably experience blockages. As unavoidable as those blockages may be, it’s important to deal with them promptly, and high pressure water jetting is one of the most effective methods out there. High pressure water jetting is exactly what it sounds like: it sends pressurized water through a special nozzle that blasts grime, gunk, buildup, blockages, and objects down sewer lines. Water jetting sends nothing more then pressurized water into the sewer, so it’s a more environmentally friendly alternative to harsh chemical-based drain cleaners. Before water jetting, it’s best to get a video sewer inspection. 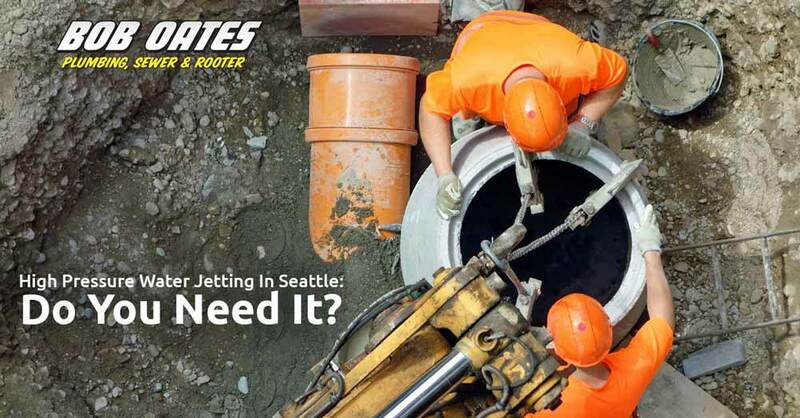 If you’ve been experiencing poor drainage or backups, a water jetting might do the trick, but it’s also possible that you need a full rooter service (Bob Oates offers the best in Seattle!). Water jetting is best used when sewer lines get backed up with accumulated waste. The special nozzles used send out a stream of water that works just like a movie laser—it’ll cut through just about anything and send your blockage down the drain. Water jetting can be the only way to clear blockages within larger diameter commercial and municipal sewer lines. If you’ve been experiencing poor drainage or wastewater backflow in your home, it’s possible you have a blockage further down your sewer line. While this is a good indicator, the only way to be certain what’s going on and what can fix the problem is with a video sewer inspection. Poor drainage and wastewater backups are more than a hassle, they can be a health hazard. High pressure water jetting is the most effective and environmentally friendly way to keep your sewer line flowing free and clear. If you think you may need a high pressure water jetting in the Seattle area, call the experts at Bob Oates Plumbing, Sewer & Rooter!